I watch live ASL games on VASL like people watch TV. There’s almost always something going on and it’s a good way for new folks to get some context for understanding the ASL Rulebook or simply to see how they can expand their opponent horizon from local to global. 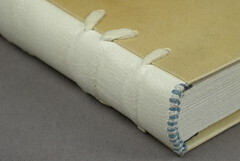 “Von Marwitz” on GameSquad recent wrote a great “Step by Step” to do just that. So the following is posted with his permission. #1. Don’t be afraid to try. Only the question that is not asked is dumb. #3. If you log on to the VASL server, you will find yourself in the “Main Room”. The actual playing goes on in the other rooms, often titled by the name or ID of the scenario. You can join a room by syncronizing with one of the players in it. Personally, I send a short Personal Message to ask if it is ok to sync before I do so. Usually I get a “Yes, sure.” in short order. Once synced, you will see the playing area, the log and counters moving about. Common etiquette is not to move their counters (you can do a mouse-over to expand stacks depending on your settings which they will not see on their screen). You do not hit any dice-roll buttons etc. Normally, you would not type anything into their log unless you previously by Private Message inquired if it is ok to do so. This is the basic etiquette. Most VASL-players use a combination of VASL and Skype because communication is quicker. As an observer, this makes it a bit more difficult to follow the game, especially as a newbie, because you might not be able to glean what the reason for some dice rolls in the log were. If players don’t use skype, they will (necessarily) type that into the log. Sometimes, people are willing to add observers to their Skype call so that you can listen in (which you could find out by inquiring via private message). If they do, usually you would listen and not take part in the conversation. This might be different if you have become familiar with the players. While being an observer, regardless whether via log or Skype, you do not give tactical tips to the players in an ongoing game. Usually, I would not point out rules mistakes to the players either unless I know they do not mind. And even then I would point out an illegal move via PM only to the player that just got a rule wrong. In case you do not “see” the maps, then you might not have them in your “boards” folder and need to download them first (and resync). Same is true for overlays. Then there are some “extensions”, that might expand VASL with some extra counters or gadgets. Most of this stuff can be found in the downloads section of the vasl.info website. Learning jungle terrain in ASL153 Totsugeki is one thing. Learning about Marine Raiders in the dense jungles of Guadalcanal is another matter entirely. This is HS8 Bailey’s Demise, from MMP’s Operational Watchtower Historical Study. The date is September 26 1943. This scenario as with the whole History Study, is centered around Guadalcanal. The river depicted on the map represents the Matanikau river. The Marine Raiders were looking to cross the river to the west bank to complete an encirclement. Unbeknownst to the Marines, the IJA had crossed the river and was on the east bank when the engagement occurred. The Marine Raiders came in from the top left into a wholly hidden (HIP) deployment of IJA troops. The Marine Raiders, like the IJA 1st-liners, were also stealthy. They were to cross at least 6 CVP (3 squads or other combinations) to the west bank of the river in 7.5 turns. All interior jungle hexes are dense jungle. All jungle hexes next to non jungle hexes are light jungles. The difference being while light jungle are similar to woods, dense jungle has a terrain effect modifier (TEM) of 2, does not permit fire groups and allows a stacking limit of only two. This map’s marked with “crags” (4 point stone formations) merely to remind ourselves that the marked hexes were dense jungles. The map above was my IJA setup, units unhidden for your perusal. The mortar team down on the bottom left was largely ineffectual against American counter-battery fire. I should have spread them out. This was the Marine Turn 2. The Marine made contact with the defenders and withstood IJA fire rather well. 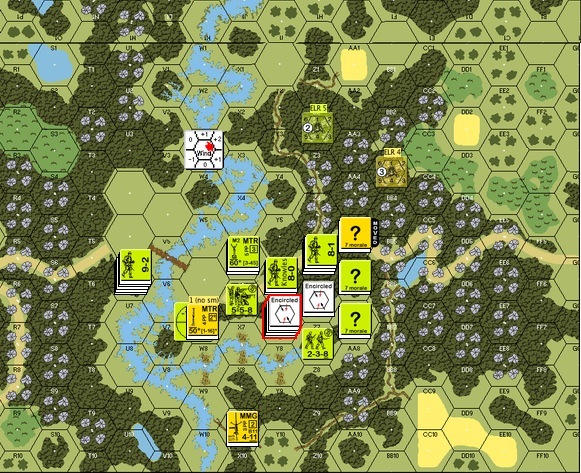 Taking the risk to move in stacks (given the +2 cover of the dense jungle) their Advance Fire was devastating round after round for the IJA. 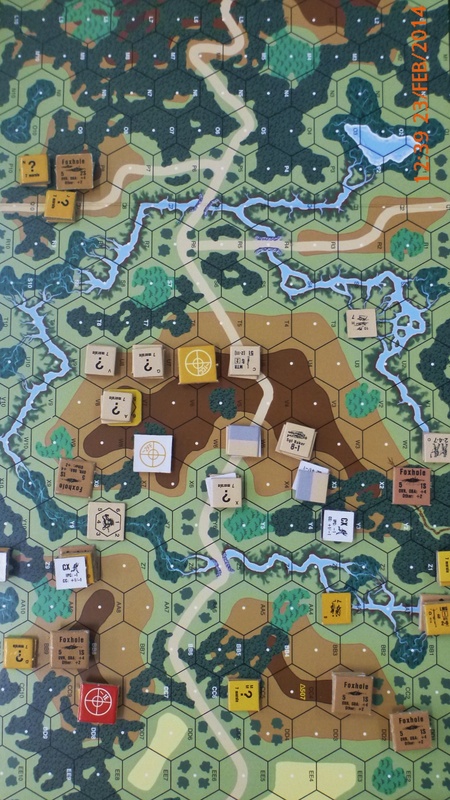 The IJA looked to block the Marines as much as possible, rout back (squads breaking “automatically” into half squads in the process) when in doubt and take advantage of their leader’s “Commissar-like” ability to rally them without (DM) penalty. As I expected, the Marines avoided the bamboo patches on the right and came in from the top down. Please keep in mind that IJA counters in faded yellow were hidden units that the Marine player couldn’t see. This is the IJA Turn 2. Some of the frontline IJA routed back. The IJA mortar team on the left was completely shot up. American Turn 3. The rallied IJA put up a fight in face of the advancing Raiders. IJA Turn 3. The IJA rallied and reconstructed a respectable line of defence. In retrospect this approach didn’t work well. The IJA, even concealed, could hardly withstand the withering Marine gunfire. Perhaps a better strategy is to pair up the half squads. One half squad would go aggressive, knocking off US concealment counters and drawing fire. The other concealed half squad will close and either hope for an ambush in close combat. Talking about close combat, the Marines with their overwhelming firepower are deadly in normal CC (plus the IJA has no favorable modifiers). Here you have a HIP squad that sprung out in the hopes of assassinating the Marine 8-0, they were promptly killed in CC. I should have avoided normal CC with Marines to start with. Hand to Hand (HtH) combat, when done with sufficiently lopsided odds (IJA half squad vs one or two Marines squads) offer a good trade for the IJA since the results of most are mutual annihilation! Other than that, I should have ran! Marine Turn 4 : here you can see how the Marines were already crowding the last passage way towards the river. A Raider squad jumped a concealed IJA half squad and was ambushed and killed. That was unfortunately the only time when close combat went happily for the IJA in this game! 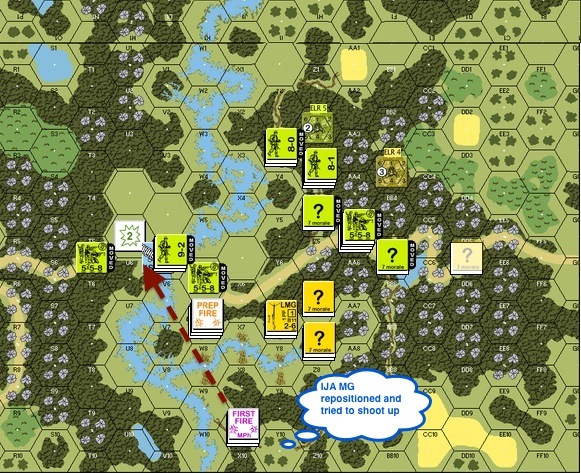 IJA Turn 4 : The situation doesn’t look good for the IJA but they were still fighting hard. Here you can see a Marine stack breaking voluntarily and routing away from possible IJA close combat. Here’s a thought : had I not used the hidden IJA units in close combat, they could have sprung up now and kill the whole stack! Marine Turn 5: the Marines started to cross the river!! A repositioned IJA machine gun put the west end of the bridge squarely in its sights but it couldn’t stop the flow. 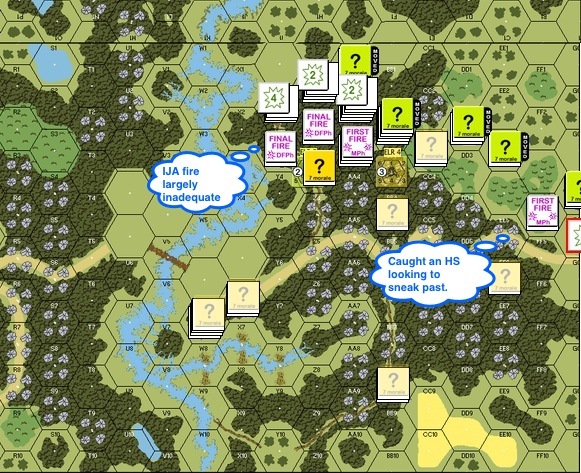 IJA Turn 6: This was how it ended for the IJA, decimated and encircled. Using my HIP units largely for cutting rout paths. Pair up units (half squads), keep one concealed and use one for knocking off enemy concealment, with the hope of trading half squads for bigger stacks of Marines in hand-to-hand combat. I thought of stacking IJA units to give them heavier fire power since I can’t create fire groups in dense jungles but I think that will just create bigger targets for blistering Marine firepower. 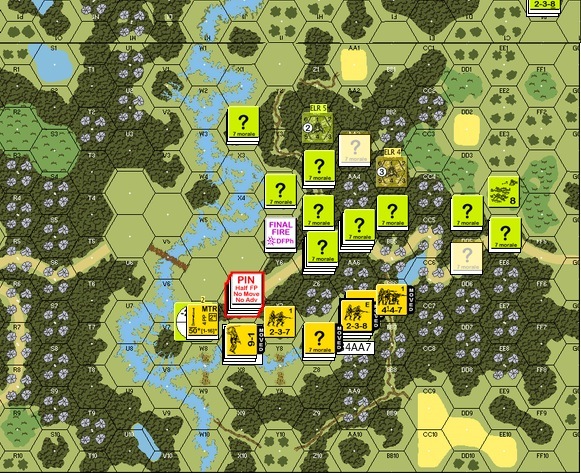 While retreating and blocking as the IJA might be a good idea at times, I should keep at least a 1 hex distance from the Marines. That way the Marines would need to use advancing fire against my concealed units. What happened to Banzai charges? What’s your experience with fighting cardboard Marines in the jungles? What are your thoughts? Maik Brinkmann is a methodological player with a great personality. 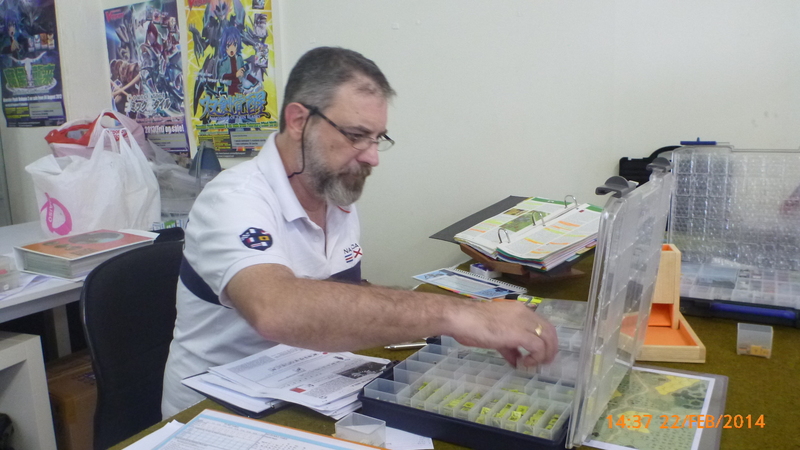 He stores his counters in boxes of little white envelopes which hints at an equally efficient and practical mind. We decided on playing A Bloody Harvest through email correspondence before I arrived at Singapore. Bloody Harvest – old VASL setup for illustration only. Germans started from the top of the board and their goal was to clear the area I got marked at the bottom of the board clear of “good order” Poles. I played the Poles. I decided to place my medium machine gun on the 1st level of the stone building that faced the grain field. From the Pole’s angle there were three possible approaches. There was the right side that is heavily lined with trees where the German could very well approach. I placed 2 trenches within those woods to delay the Germans. I made sure that the two trenches upfront can support each other (and not be able to shoot at each other). There was the grain field in the middle that my medium machine gun (MMG) covered from the first level of the stone building. I also had a squad in a trench that covered the road leading up to the grain field. There’s also the left side that’s less wooded and was the longer way around. I had a trench with a squad on the immediate left of the village, plus another squad in a stone building on the left covering that approach. If needed, they could move back to the village to help. Maik divided up the Germans and attacked down both flanks. He was bogged down on my right as the Poles withdrew into the village. He made better progress on my left but couldn’t converge onto the village in time. The funny part was a stubborn Polish half squad that kept running retreating through the grain fields while harassing the Germans on the left. It absolutely refused to be broken. It was a great game that introduced me to a new friend. Mark Humphries need no introduction in Asia or globally in the ASL world. He runs the ASL Ladder from the Philippines. We decided on Lenin’s Sons and he gratefully allowed me to play the defending Russians. Lenin’s Sons – old VASL setup for illustration only. The Germans attacked down the length of the board looking to capture most the buildings on the bottom of the board. 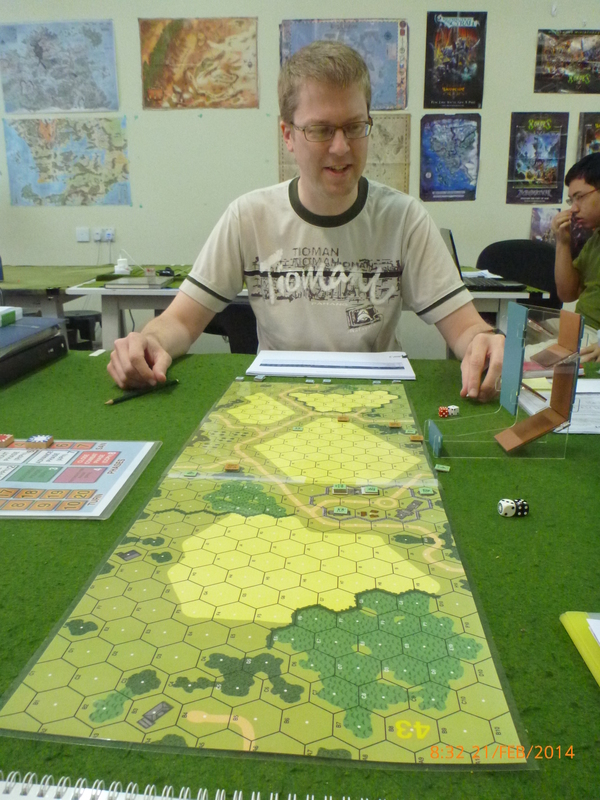 From the Russian point of view, the left side of the board is open ground. The German had a big wooden building at their jump off point. The Russians had a hedge and an orchard in front of the buildings they are to defend. On the right side were the woods. From Mark I could see how ASL is really a game of movement. The Germans would always move forward in every turn. I failed to create a cross fire on the left and the SS was able to process across the open ground without breaking much until their rifles came into range. In the woods on the right side Mark was constantly looking to encircle the retreating Russian troops. The Russian had a demolition squad hidden in the woods and were able to channel a leader and a squad towards them but my timing was wrong. The demolition squad sprung out, got shot, and the demolition pack went flying harmlessly through the air. It was a slow game but Mark made progress in every turn. By mid game he was already in the orchards in front of my buildings. Another great game! Mark showed me how it’s done : attacking in open ground and in the woods alike. 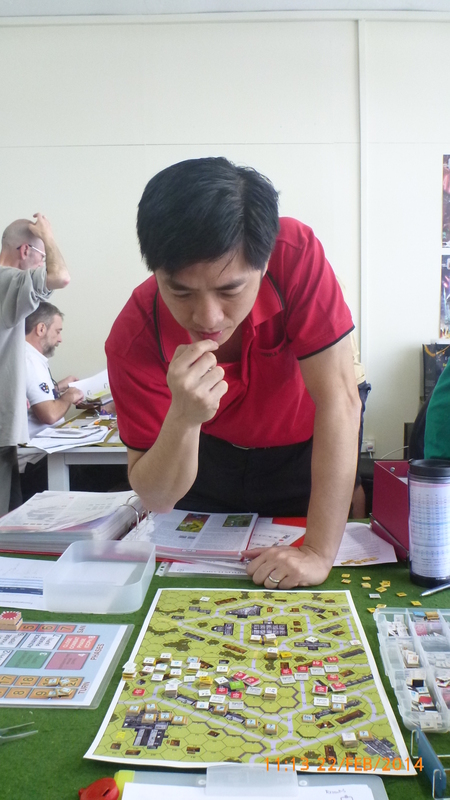 Jamie Lee is an experienced war gamer who is a newbie with ASL rules but is very well versed tactically. The Singapore ASL’rs warned me about him. On the other hand, he’s very unassuming and can easily disarm the unwary. The scenario was Shanghai in Flames and I played the Chinese. I played this a while back with Erwin Langlois before and I enjoyed it immensely. Shanghai in Flames – old VASL setup for illustration only. The large building on the bottom left of the map was the Sihang Warehouse (factory). 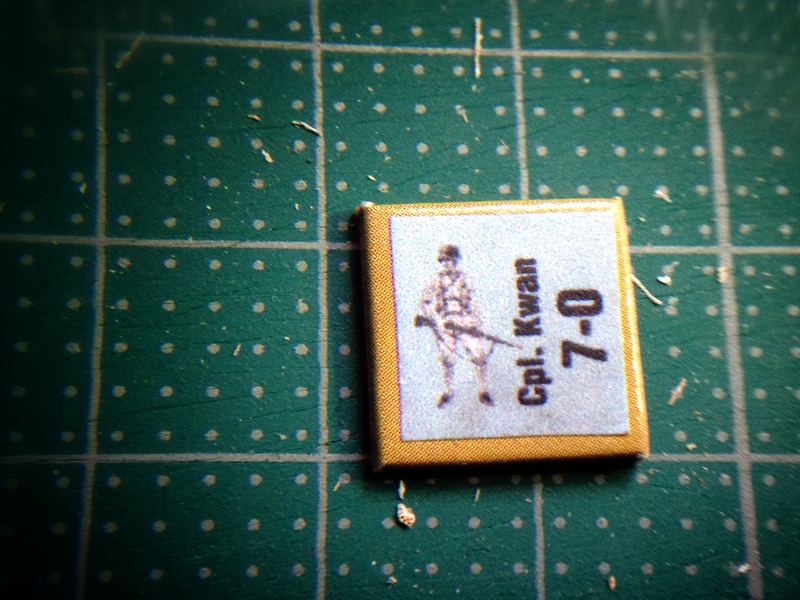 The IJA were to clear the factory of all “good order” Chinese squads. Squads in the factory were fanatic (a point I forgot at the tourney). From the Chinese point of view, the likely angle of Japanese attack would be down the left side of the board along the line of buildings. The big stone building in the middle of the board was a good jump off point for the final attack as well. The Chinese got 3 fortified hexes and instead of fortifying the 3 top hexes of the factory to prevent the Japanese from charging directly in, I only fortified the middle hex the hex to it’s right. With the risk I took from not fortifying the left, I exchanged that for a tunnel that linked the building on the left to the row house on the right in front of the building. My plan was to fight a delaying retreat down the left side while a leader and a squad start a fire on the building to the left in front of the factory. They could use the tunnel and go to the row house on the right and start fires there too, thereby denying the IJA of jump off points. There was also a Chinese MMG team together with a protective squad and a 7-0 leader all the way down the street on the right side of the board. Given there were two long streets, I plan to cover the first with a long fire lane, and move to the street closer to the factory when the IJA broke through. Guess what? The 7-0 overseeing the operation was none other than “Corporal Kwan” recently designed by the talented Sava Toufexis. As it turned out Jamie was a lot faster than I expected in fighting through my retreating squads on left flank. 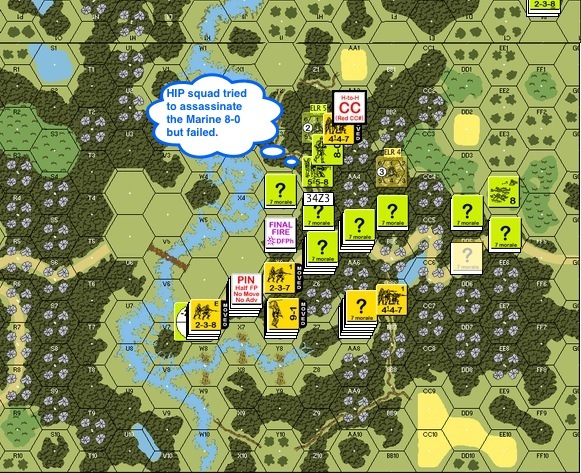 A dare death half squad made its début by playing dead for a while and finally snapping off its concealment and delivering point-blank fire into a stack of passing IJA squads and a 10-0 leader. 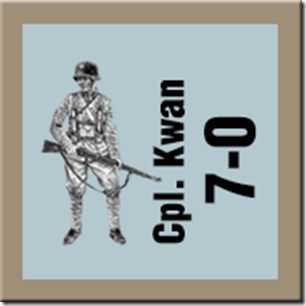 The shot wounded the 10-0 and decimated the IJA squads. Another volley from a squad between building killed the 10-0 and further amplified the misery. The Chinese managed to set fires to the building and woods on their left flank and routed to the row house on the right. By that time the IJA forces had already arrived to prevent further acts of vandalism. By mid game the IJA was in the row house along the right of the factory. I lucked out in that the building to the left of the factory was on fire, denying its use to the IJA and making my unfortified left factory hex less of an issue. 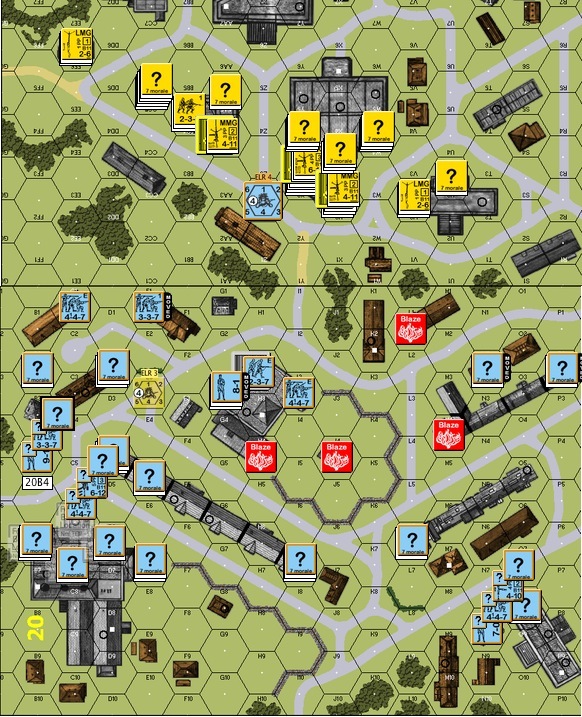 After a few turns the IJA broke through into the factory from the right but the Chinese squads had spread themselves out on the factory floor, promising another 2 to 3 turns of close combat. The IJA simply ran out of time. Jamie is very strong tactically. He’s also very fluid in his thinking, making him a very tenacious opponent. This scenario went for 7 hours before we called it. Vlad has been ASL’r for a while. He was one of the first guys I came into contact with when I got into ASL. I remember one of my first chats with him was about how he felt about his Kampfgruppe Scherer purchase. We agreed to Brigade Hill with me being the IJA. There were four hill tops on the map. The Australians started the scenario owning the hill-top on the top left of the map (approached by concealed IJA at the time of the photo). They were to control, three or more hill tops out of the possible four. Starting from the general direction from the foxhole on the top left of the map, the Australians probed both sides of the big hill before moving onto the first hill top. That might have burned more time than the Australians could afford. While I had the hill top bore sighted, I forgot to use the die roll modifier in the excitement. However when an Australian half squad, a squad, a leader and a machine gun moved into a nice clump of woods to set up a fire base on the hill-top, I remembered to spring forth a hidden IJA squad! The IJA initial triple point-blank fire on the stack didn’t have any effect but the Australian advance fire striped the IJA. They reduced the Australians in the mêlée and ultimately killed them all in the next close combat phase. The Australians made a bit of headway chasing a mop of IJA half squad rabble through the woods on the right flank beyond the first big hill. 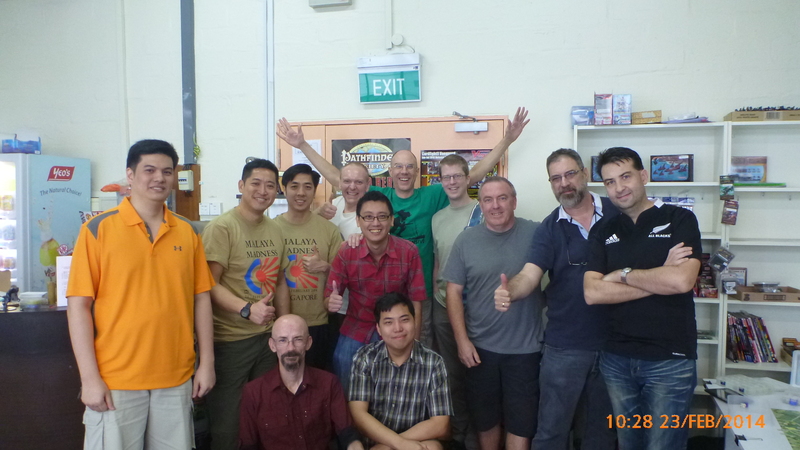 They cornered and killed off a half squad and the 9-0 IJA leader and one of the Aussie half squads went fanatic. When the Aussie reinforcements appeared from the bottom right encircling the “bottom right hill” it looked bleak for the IJA. The Australians who killed the IJA leader jumped another IJA half squad in close combat and got ambushed instead. The Aussie half squad got slaughtered and I was going to infiltrate the victorious IJA half squad back closer to the “bottom right hill” but suddenly I had a thought. I moved the IJA half squad behind the pursuing Australians. That IJA half squad then eliminated a stack of routing Aussies!! When the leader and a squad among the incoming Australian reinforcement broke, I double-timed a squad of IJA through the orchard behind them as well, a lone surviving Aussie squad defensive fired through the orchards but IJA squads had ever been stopped from going wherever they wanted to go. The IJA squad was in a position to eliminate the routing Aussies against the board edge in the following turn. The small IJA reinforcement found the Aussie foxhole on the top left guarded by a lonely squad. They advanced up the hill and did a one hex banzai charge into the foxhole. The “score” between the IJA and the Australians went back to 3 hill tops to 1. The Australians had two more turns left and decided to concede. Vlad is a meticulous and a very fair player. Throughout the game he kept reminding me of repairs, missed negative die roll modifiers (on my shots) and (my) SAN etc. It is an honor to play him. Ian Percy’s comment I overheard about him not “doing things” to his opponents but “constantly presenting tough choices to the opponent” and “making HIM do all the work”. Given enough choices his opponent is bound to make the wrong choice and choke. The power of IJA behind the enemy and the horrific efficiencies of eliminating the stacks of enemy squads for failure to route. 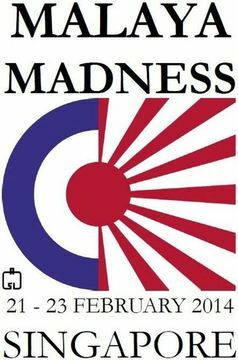 I wasn’t going to pay for a plane ticket to go to Singapore for the Malaya Madness. The thought of putting up the time and the expense to go to Singapore to play ASL when I can play games with anyone over VASL was simply too crazy to consider. However, my two mentors : Don & Witchbottles both advised me to go see for myself. My family, surprisingly was easier to convince than I myself. I don’t know anyone there but a lot of the ASL’rs must know each other already. They are just going to talk and to play with each other. I am just a newbie. What’s the fun in losing all my games? The Tourney Director matched players based on their skill levels. Besides, everyone I met are a total pleasure to play with or without the competition. I played quite a few people around the world too on VASL. I can lose games equally well on VASL without having to travel, thankyou. Face to Face games carries a dynamic that just doesn’t exist via other mediums. The chatter, the shrieks, the comments, the groans and screams of delight over die rolls, make FtF experiences second to none. Besides, it’s even more fun to play people over VASL (afterwards) when you know who they are. There are a lot of ASL tourneys every year. If it’s within your realm of possibility to go, go. Go at least once. And tell me how you feel. It might just change your ASL life too. 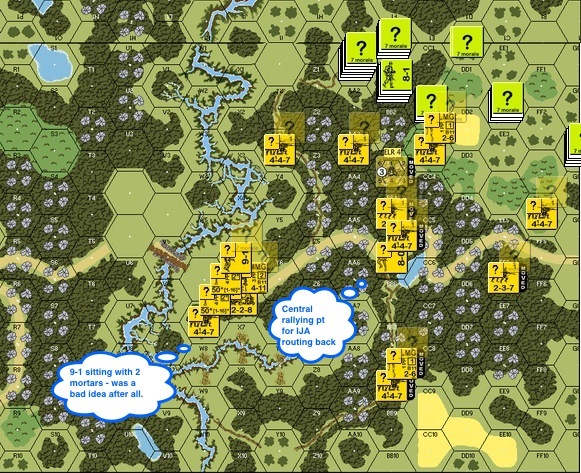 Posted on August 19, 2013 by Hong Kong Wargamer Tagged Advanced Squad LeaderASLAvalon Hillboard wargamelearningprobabilityprobability tablesSnipertacticswargame	Comments2 Comments on Should I Stay Or Should I Go? Probabilities in Advanced Squad Leader. Should I Stay Or Should I Go? Probabilities in Advanced Squad Leader. I still remember my Grade 9 math classes on Probability. Those classes are perhaps one of the most useful ones I ever had. My teacher took all the most common casino games and lotteries schemes and had us calculate the probabilities of different outcomes for each. You can imagine how delightfully interesting that semester was. One result is that I don’t gamble all my adult life because we proved to ourselves mathematically that the house ALWAYS win. 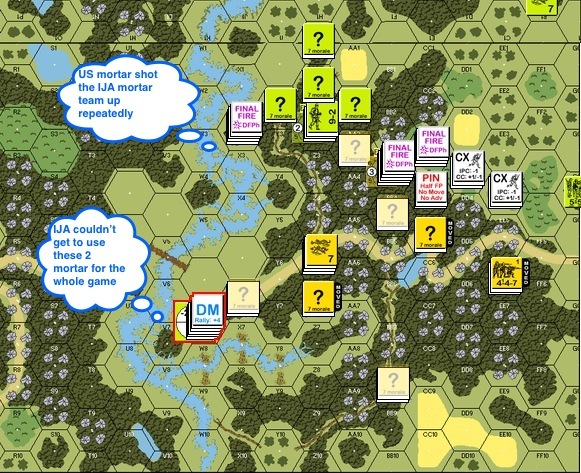 Probability plays a huge part in Advanced Squad Leader through the use of dice rolls (“DR”). As with life, different decisions carry different levels of risk and are reflected through the use of dice rolls in the ASL world. Grognards I play with have probability tables committed to memory. So what does this all translate to? A Light Machine Gun (“LMG”) rate of fire is “1”. That means LMGs have a 16.67% chance of firing again and a 2.78% chance of firing 3 times. For Heavy Machine Guns (“HMG”) with their rate of fire of “3”, their chances of being able to fire again goes to 50%. There’s a 25% chance of the HMG being to fire the third time. If you take into the account that HMGs malfunction at a DR of 12, the probability of HMGs being able to fire a third time without malfunctioning is 22.97%. Think of that the next time your squad face one down. Sniper rules in ASL are interesting. For some, it stops us from firing off every squad on the board when the odds of shots having any effect is low. However, the probability of a DR triggering a SAN and for the sniper to active is actually pretty low. A SAN of 4 gets triggered only 3 out of 36 possible outcomes with two dice. You need a further roll of 1 or 2 on a single die for that sniper to be active. End result? A SAN of 4 triggers a sniper with some effect only 2.78% of the time. 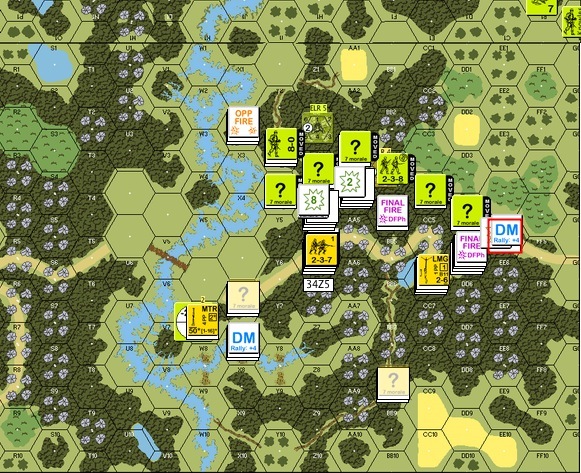 I read Mr. Robert Medrow’s excellent article “First Impressions – A Introduction to Advanced Squad Leader : Infantry Training” almost a year ago when I first looked to learn the game. It didn’t hit me much at the time. A big stack of games afterwards, it certainly does. It’s in Avalon Hill The General Magazine, Vol 22 Number 6. Take a look at Mr. Medrow’s Table 5 “Probability that a single unit will survive and attack either unharmed and unpinned or (unharmed and pinned)”. 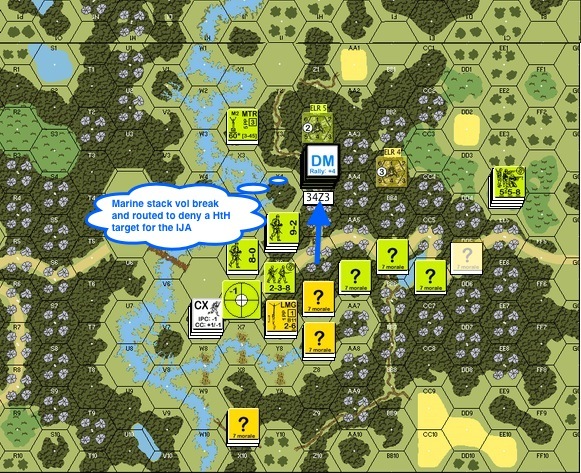 One of the games I am currently playing has SS troopers (Morale level 8) attacking 1st Line Russian squads (Firepower 4). That means if a SS squad run across the open, its chances of survival is 49% (Table c). Those opportunities are hard to come by however, if the squad decides to Assault Move on open ground, its chances of survival is 60%. If I can’t hit it while on the move but try to shoot at it during my Prep Fire, its chances rise to a whopping 94% sitting in some stone buildings! However while I have 6% chance of doing anything to it, I have only 0.93% chance of being sniper bait (German SAN 2). I might just go head and take the shot anyway, for lack of better alternatives. On the contrary, my Russian squads are fine 91% of the time sitting in stone buildings against inherent firepower from the SS squads. They have a 84% chance against an HMG firing once but a 70.6% against HMG being able to fire twice, which is 50% of the time. Against HMG firing 3 times (25% probability), their survival dropped to 59.3%. That is lower odds than squads getting caught in the line of fire while skulking – 64% against inherent firepower. See how much fun it is? Plus that’s just with one of Mr. Medrow’s probability tables. Every action in ASL carries with it the inherent benefits and risk. It’s the optimisation of these choices that makes Advanced Squad Leader so perpetually engaging!